Richard Gay and wife Kathleen took the decision to build a pool in their back garden to teach youngsters to swim, following the closure of their local pool. A former rugby league player future-proofed his business and secured vital swimming lessons for some 250 children by installing his own swimming pool at home. Richard Gay, a former Hull rugby star, and his wife Kathleen, have taught more than 5,000 children across East Yorkshire through their Waterworld swim school. When closure of Sydney Smith School in Hull left the couple struggling to find appropriate water time, Richard and Kathleen took the bold move to apply for planning permission to build an indoor pool at home. Planning permission was granted for a 6 x 3m indoor pool, which was designed and installed by Lincolnshire-based Grayfox Swimming Pools. The concrete pool features a fast lane counter current unit from Certikin, plus an Aquaflex Geobubble cover. A Calorex Vaporex 55 unit provides the dehumidification within the pool room, and the pool is finished with foggy light blue mosaic tiles, plus two underwater lights. 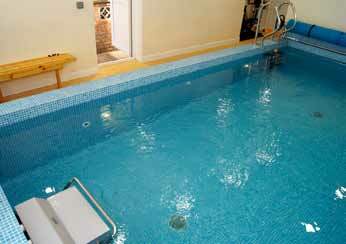 Completed at the end of March, the pool is now a busy hub for the couple’s swimming tuition programme.